Preserve your memories by transferring your favorite photos to boards…then add vinyl lettering to complete the project. This project is not difficult, but it does require several hours of drying time. The supplies you’ll need: board, paint, brush, gesso, rag, disposable bowls, photo from laser printer (printed in reverse), vinyl lettering, burnishing tool. Paint your board with white craft paint and allow to dry completely. Paint the top surface of your board with gesso. Paint the front of your photo with gesso. Apply the photo to the board with the photo side facing down. Carefully smooth out any bubbles using your burnishing tool. Wipe away any excess gesso. Allow to dry for at least four hours. Paint the front of your board and the front of your picture with gesso. After at least four hours have passed, take a warm damp rag and lay it on top off the board. Leave it on for about five minutes. Remove the rag. Using your fingers dipped in water, make small circular motions on the board to remove the top layer of paper, almost as if you are sandpapering the surface. Dip your fingers in water and rub in a circular motion to remove the top layer of paper. When you’ve removed the top layer of paper and the project is completely dry, apply a coat of ModPodge to the front of the photo/board. Repeat two times, letting dry about 15 minutes between coats. When you’ve removed the layer of paper, allow to dry then apply ModPodge. It’s vinyl time! Choose an expression from Uppercase Living like the one here or custom design your own using the MyDesign Tool (choosing your font, size and color). You could customize the place and date for your photo (such as “Cape Cod 2016”). Remove backing paper from vinyl expression, adhere to surface, then remove transfer tape. Need tips on applying vinyl? Check out my post with how-to videos. Recently, I had the opportunity to help a church solve a problem and implement their vision. They wanted a way to provide welcoming signage that clearly stated where families should enter on Sunday mornings. At first, they had a large banner hung across the windowed entrance, secured by heavy steel cables. PROBLEM: heavy winds caused the banner to tear and the cables to knock against the glass. SOLUTION: Create the general design of the banner (silhouettes of children in action) in Uppercase Living vinyl! With the assistance of a friend and a cherry picker (yes, that’s us in the bucket), the silhouettes were applied to the front of the building, one by one. Here’s our view of the parking lot from the bucket! Have a problem — big or small — with your business’ walls? Contact me and let’s talk about a solution. How to install a UL clock mechanism…and vinyl, too! 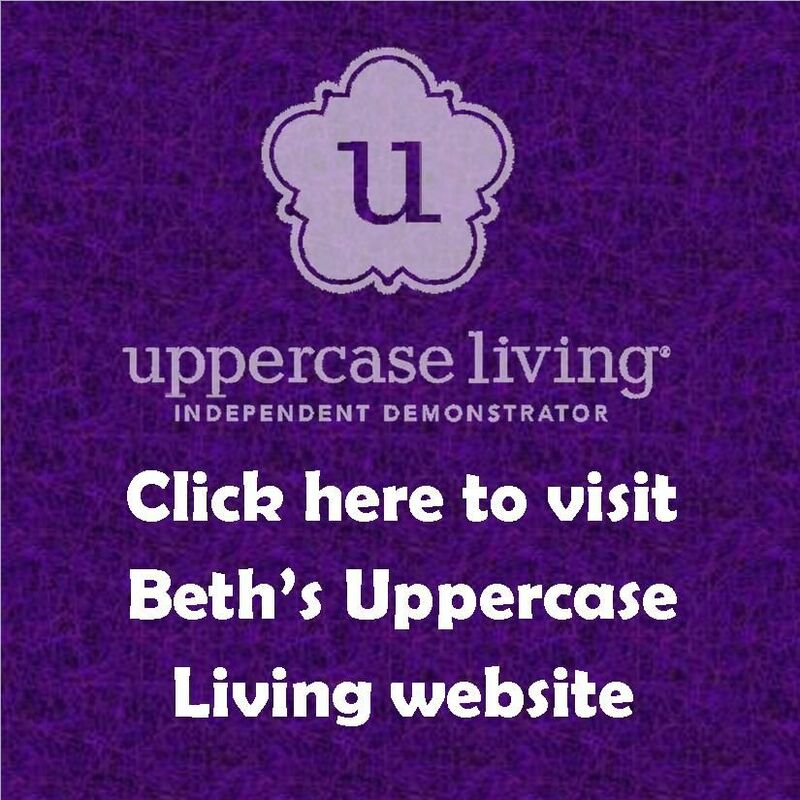 Are you ready to install your clock from Uppercase Living? No matter which style you chose (and you have so many to choose from! ), the clock mechanism will be the same. Here’s a short video that shows you how to assemble your clock mechanism like a pro. Ready to install your vinyl lettering? Here’s how. 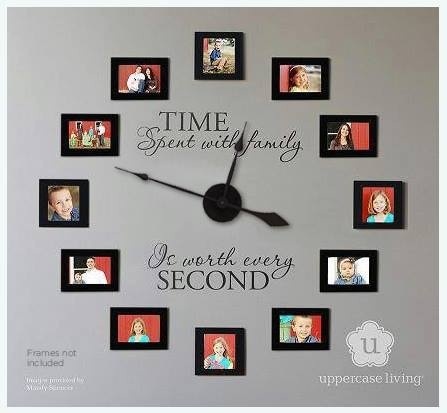 Want tips for adding your framed photos around your clock? Check out this blog post. Questions? Please contact me for assistance. March Special. A little something for my customers and a big something for my hostesses. What is your stretch goal? What are you working towards that, when you achieve it, you will have that sense of accomplishment that only comes with determination and sacrifice? You’ve got to put that goal out there where you can see it; you need to be reminded of it every day and work at it. Every. Day. Here are a few ideas for keeping your Big Goal in your line of vision. Gather pictures of what you’re working toward. Is it a destination? A new home? A more fit physique? A degree? There’s a pretty good chance you’ve already pinned some of these things from Pinterest, right? Create a vision board where you can place these pictures — along with inspiring quotes — to keep you focused on your goal. Create a vision board. Shown here: She Believed She Could So She Did vinyl expression from Uppercase Living (item #21964) in Wild Raspberry on Creme Punched Metal Tile from Uppercase Living (item #300111). Click picture for ordering info. Create an acrylic block bank. Shown here: She Believed She Could So She Did vinyl expression from Uppercase Living in Wild Raspberry (item #21964) on acrylic block from Uppercase Living (item #300130). Adhere scrapbook paper to inside of back of block. Create an acrylic block bank. Shown here: She Believed She Could So She Did vinyl expression from Uppercase Living in Wild Raspberry (item #21964) on acrylic block from Uppercase Living (item #300130). Add ribbon and embellishments (such as costume jewelry, buttons, artificial flowers, etc.) to outside of block. Be inspired. Put words of affirmation where you can see them: right on the wall or on your laptop. Whether you place them in a frame or adhere vinyl lettering directly to a wall or other surface, it is important that you have messages that uplift and inspire you every single day. Here are the achievement and event charms I’ve earned with Uppercase Living…sitting on top of the expression: She Believed She Could So She Did! It’s not easy to achieve Big Goals. But, it’s important to set them, to work towards them, and to celebrate when you achieve them. I know it’s snowing, but we can still think spring, can’t we? I’m really good at some things. I mean, we all are, right? And then there’s THAT. There are some things that I have a hard time doing. The tasks themselves aren’t difficult, but as it turns out, I’m heading-towards-lame when it comes to duties that — to me — lack the “wow” factor. Like laundry. Recently, one of my boys revealed he is having a difficult time focusing in school. The behavior is mirrored at home in many ways. We are working with a team at his school to give him some strategies for coping. (Should we discover the behavior modifications aren’t working, we will continue to the next step.) Keeping him on task (when it comes to chores around the house), has made me realize how many less-than-exciting tasks I put off until they become overwhelming. Again, laundry comes to mind. I have to say my Mom is one of the most get-it-done people I know. She tackles the small stuff before it becomes big stuff. I need to learn to do that. Yesterday, I made a very conscious effort to do a bunch of the little errands/jobs that I usually put off until the last possible moment: post office! unpacking the suitcases from our recent travel! insurance issue! Checking those little chores off my to-do list didn’t take as long as I had expected (dreaded) and resulted in a less stressful evening. Which reminds me. I’ve got a load of laundry to deal with. Here’s a fun DIY project that will make a thoughtful gift for friends & family and add a festive touch to your own home. Add the vinyl expression shown here to a shadow box for a fun and festive piece to display year after year. Add jingle bells…a little or a lot! Here’s how to create one for yourself or to give as a gift. Choose the “Jingle All The Way” expression in your color choice from Uppercase Living. (Order here.) Choose the 10″ x 10″ expression for a 12″ x 12″ shadow box. Fill shadow box with jingle bells. (There are lots of bell options on Amazon.) You can use any color you’d like…and even use different colors to represent each generation in your family. 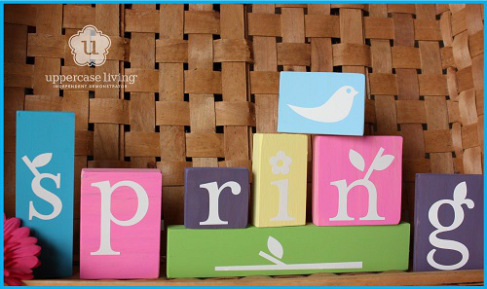 Here’s another idea for using Uppercase Living vinyl on shadow boxes.